The long-established Japanese confectionery "Hashiriimochi Roho," in Yawata City, Kyoto Prefecture, created the sweet treat, "Shokado Afternoon Tea," which was inspired by the quartered meal boxes of "Shokado-bento" that originated in Yawata City. Bite-size rice cakes and other items are arranged into the cross-partitioned box. It has a colorful appearance, that would surely be popular on Instagram. This treat was planned in hopes of enlivening Yawata City, which has seen successive damage due to earthquakes and typhoon, by attracting tourists. Shokado-bento is believed to have originated from quartered boxes such as the tobacco tray or a small paint-dish which Shokado Shojo, a cultural figure and Buddhist priest of Iwashimizu Hachimangu Shrine in the early Edo Period, used at tea parties. In Yawata City, the lunch boxes are served at Kyoto Kitcho Shokado in the Shokado Garden and Museum. Shokado Afternoon Tea includes a sweet resembling the Yawata City local dish of "Yawata-maki," or burdock root rolled with eel and other ingredients, which was made with sweetened burdock root, sweet bean paste and bun dough. 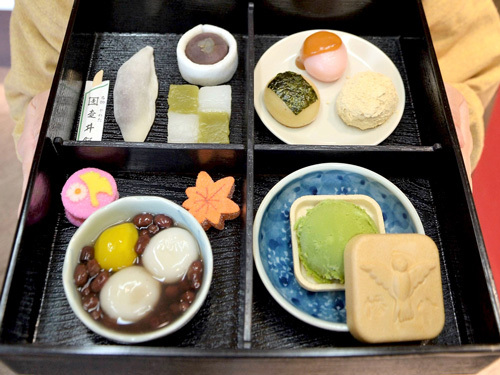 There are a total of seven, mildly-seasoned sweets such as "Hashiriimochi," or red-bean jam rice cake, sweet rice jelly, bite-size rice cakes flavored with yuzu-miso or soy sauce or a mixture of ground pepper and other spices, "Hato-monaka," or wafer filled with matcha ice cream, sweet red-bean soup with rice-flour dumplings and a chestnut, and dry confectioneries. The sweets will be changed seasonally.